ProPaintball insiders dug up several gems for this weeks pro paintball rumor report. Read on for the latest player movements and pro team adjustments. 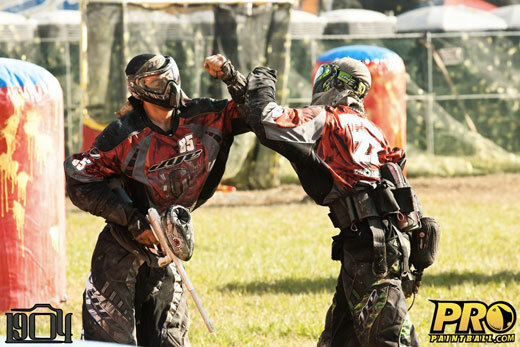 Scott Kemp and Brandon Short of pro paintball team LA Ironmen won’t be at PSP Galveston Open. Anson Hong (formerly of pro teams Legacy/BLAST) is said to be getting married and they will be attending the wedding. Contrary to rumors circulating, Ryan Martin (Ironmen) will be playing Galveston with the Ironmen. Tommy O’Donnell from Indianapolis Mutiny has joined the San Diego Pirates in PSP D1. Rumors also circulate that Brandon Short recently broke his finger playing UTB and may need surgery to repair the damage. Busted! Raney Stanczak is returning to the paintball field after a short break. Raney will be playing Galveston with Greg Pauley and the AC402.com paintball team in D2 and then D1 with Texas Storm at the NPPL Surf City Open. Greg and Raney are long time friends and started playing together in 2004 under the DIESEL banner. Raney most recently played with San Diego Aftermath but took time off to pursue his college education. ProPaintball insiders say he has the paintball itch and is looking to get back in the mix. ProPaintball insiders report that Mike Carthy & Tampa Bay Damage part ways. No word yet on what the future holds for Carthy. The New England Avalanche tryouts are said to have been a success. Joining the pro team is Matt Darulla, Benny Caroll, Steven “P-Nut” Schloss and one other. According to sources, Top Gun Evolution will be rebranded as Avalanche Evolution for 2012. If you enjoyed this paintball news and rumor reports, please follow @ProPaintballCom on Twitter!